I have had so many LGTBQ students in my counselor caseload over the past year, I felt like I needed some training to best serve my students. I have learned lots from the workshops I have attended and I know there is still so much to learn. One of the tools I have used with students and parents is the Gender Unicorn from Trans Student Educational Resources. In my experience in working with my students dealing with gender identify issues, the conversation is never black or white. The feelings and expressions of gender are always unique and specific to that particular individual. 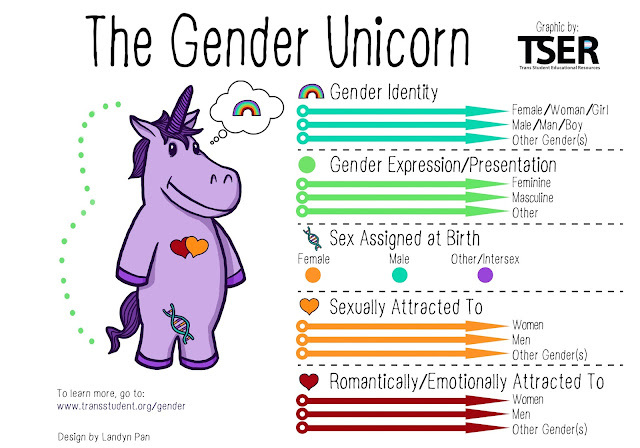 That is why the Gender Unicorn has helped me in understanding how these young people feel. The issues with gender identify and expression, as well as who they are attracted to romantically, sexually, and emotionally, are all unique to the individual. The feelings are neither black or white, where on this graphic is explained on a spectrum of feelings. Each individual is unique when placing themselves on these scales of identify and feelings. Individuals may place themselves on this spectrum in different spaces during different times in their life. Create a supportive family environment - The ability to make the home a sanctuary of security and support for your child is the single most important factor in promoting lifelong health and well- being for your child. Such an environment creates a buffer for your child from the hardships they may face outside of the home. Creating such a space may not come easily for you, particularly if you are struggling with accepting your child’s gender identity or expression. If so, seek help from an empathetic, knowledgeable friend, family member, support group, therapist or other source of support. Require respect within the family - With immediate and extended family, it is imperative that you require and accept only kindness and respect for your child. While you may not be able to change people’s opinions, you can certainly dictate how you expect others to behave and speak around you and your child. It can be scary to make this demand of family members, yet many parents report that once they’ve taken a stand on their child’s behalf, they feel a great sense of relief and empowerment. Express love and support for your child’s gender expression - What does this look like? It means allowing them to choose, without pressure or unspoken messages, the clothes they wish to wear, how and with whom they play, their favorite toys, the accessories they favor, the manner in which they wear their hair, and the decorations and images with which they surround themselves. It means helping them prepare for any negative reactions they may encounter outside the home by practicing their responses with them and making sure, when appropriate, that there is a safe adult for them to turn to in case they need assistance. It means discussing any negative or conflicting feelings you are struggling with over their gender identity or expression with other adults, not with your child. Allow zero tolerance for disrespect, negative comments or pressure - A concrete way to demonstrate ongoing support and acceptance for your child is to tolerate absolutely no negative comments about your child, from anyone, whether your child is with you or not. This means following up with the people who make such comments in a firm way that makes clear your commitment to your child’s well-being. It may also mean needing to follow up with other parents or the school about the comments made by other parents or children. Maintain open and honest communication with your child - Stay open about this journey, both your child’s, and your own. By demonstrating to them that you are a partner in this process, and showing a genuine sense of interest in how they see themselves, what they think, what they are experiencing, you show that you are there for them. This open level of communication will also help you evaluate your child’s level of stress or distress, and whether they may need additional outside support or intervention. Many of these suggestions are easier said than done. I have worked with parents who were worried about how extended family would react or even how supporting varied gender roles and identifies goes against cultural norms or religious beliefs. Having these conversations with families is never easy. As a school counselor, I tell parents that my priority is to ensure my student does well academically and is given the tools to best achieve their post-secondary goals. Providing the students with the support, safety, and love they need in order to do so is my priority. Therefore, I offer myself as a support to provide resources to best support the family to best support their child. Trans Student Educational Resources provides a list of resources to help parents, students, and school personnel to support LQTBQ students: http://www.transstudent.org/sites. If you are a parent with questions on how to help your child, call your school counselor for resources.